You just said that before I did. After day 61 (which I played yesterday) I paused this Cinderella and went back to Bareskin31 to finish it (a Sleepwalker level 7, not reported on the forums, was on day 66, the challenge goes to 100). I said pause and not stopped, cause I think I will be back to Cinderella later. 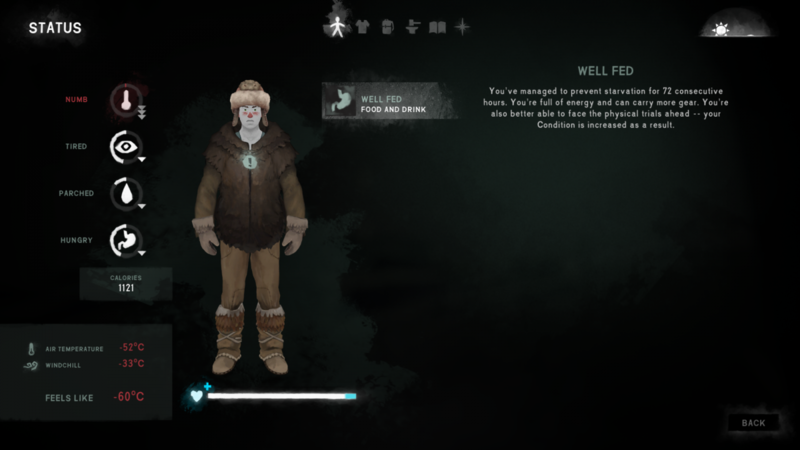 Old Island connector was a challenge, but I don't see any in CH, PV, TWM (there's a bench, the temp don't drop in Voyageur, there's an indoor cave, deers and predators, not to mention huge loot if you get hacksaw), ML, FM, MT and BRR... BUT Hushed River Valley can be fun (no bench=no craft, no tackle), and the Ravine might also be somewhat difficult. Wow -80C on Loper? D: That's EVIL! EEEVIILLL!! Then I'll have to start fires every two steps of the way. I will challenge you to that, miss! A challenge? What sort of challenge? It's going to be a very short challenge. perhaps you need to rethink the question of what success looks like in this mode. In the back of the car, a Rifle. Lol. How could you forget Flara so soon? It's worse when you think you see a mailbox and it's a wolf. I have to admit though I get scared by fluffy bunnies twenty times a day because I mistake them for wolves, something grey moving in the corner of my eye, aggh! yeah, I stopped playing Voyager after 60 days of "surviving", nothing to do anymore that could be a real challenge. I start wondering if Cinderella will not die soon of boredom. That's why I like doing a mix of both Loper and Voyager. I'm currently trying to achieve a goal of 500 days on voyager, which is a rather relaxing way of spending time, but you might grow complacent and it's a very very long game. Whereas Loper I'm finding to be very hard especially the temperature aspect of it which might get frustrating. My Loper runs end fast, so that's a good way to wake up if voyager gets slow. It's also easier to play on voyager if I'm not feeling well in rl since Loper requires far more concentration. @BareSkin My teeth are chattering even looking at that screenshot! Ugh! Is there a way to quick report the stinken spammer? Put them on ignore but still seeing the threads they opened. Milady! I challenge you to a test! This is a Voyageur settings you know very well, but without the sleep-healing. Voyageur rules: you can choose your map if you so wish, whatever gender you prefer, and up to 4 feats. Survive 100 days. Sub-challenge: Summit. I need to think of an image. Not the bunkers (prepper's caches), sorry if I misused the term. I'm talking about the small boxes with an orange top. I've found 4 in different runs, I don't know how many spawn per map run. But even with only two, the loot can be game changing. @BareSkinThat's why I like doing a mix of both Loper and Voyager. I'm currently trying to achieve a goal of 500 days on voyager, which is a rather relaxing way of spending time, but you might grow complacent and it's a very very long game. Whereas Loper I'm finding to be very hard especially the temperature aspect of it which might get frustrating. My Loper runs end fast, so that's a good way to wake up if voyager gets slow. It's also easier to play on voyager if I'm not feeling well in rl since Loper requires far more concentration. Yeah I got your point, and what I like about this game is that you have to make your own goals to make it interesting after the first runs. What I personally don't like is the totally unreal decay rate (among other things, but that's an immersion breaker for me). I'm currently playing Stalker, because on the contrary to Voyageur I can't travel around the maps as if it was not a survival game (when I get bored, I do stupid things like exploring without can/pot/bedroll/knife, on Voyageur it's not even a deadly move...). When that run will be over, I think I will go to custom settings (may be soon, after 70 days I'm already having 2 months of food and all utilities. I'll go for a mapping-all-maps challenge but I'm starting to get lazy... and wolfed... maybe I should do it 'Cinderella style', naked into any new map). Any idea when you may continue this challenge? No idea, for now I'm busy sleepwalking, but taking Cinderella to HRV could be fun since I don't know this map.